Brandon’s Sympathetic Strike began on 20 May 1919, and persisted until the end of June. It was preceded in late April by a dramatic and successful civic employees’ strike, and followed at the end of June by an ill-conceived and futile general strike. As in Winnipeg, the Brandon strike represented a struggle between two community coalitions: one included the Brandon business community, the Brandon Sun, the Law and Order League, and the City Council allied with provincial and federal authorities; the other, the strikers and their supporters, the Brandon Trades and Labour Council, the Strike Committee, and the Peoples’ Church organized during the strike. While returned soldiers were prominent among the strikers, Brandon’s Great War Veterans’ Association, like its counterpart in Winnipeg, sought to play the role of mediator in the city’s labour crisis. The Brandon Sympathetic Strike was the climactic event in a period of surging labour militancy dating from the reconstitution of the Brandon Trades and Labour Council in 1917. It was informed by the conviction that only through labour solidarity and direct action could labour’s legitimate aspirations for union recognition and improved economic conditions be achieved, and was fueled by economic grievances accumulated during the Great War. The failure of the strike left Brandon’s labour movement resigned to the futility of the general strike weapon in the face of the power of the state, yet unrepentant in the defence of the principles of organized labour. In the wake of the strikes, Brandon’s working class sought to advance the cause of labour through direct participation in the City’s political life. 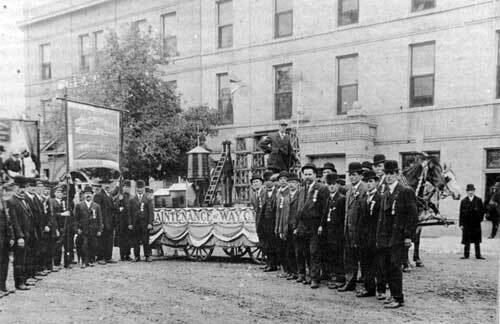 “Maintenance of Way” Union Local, Labour Day parade float, September 1913. The float won first prize in the parade. As in other communities in western Canada, the depression which preceded the Great War damaged organized labour and inflicted severe hardship on working people in Brandon. It created high unemployment among the city’s two most important groups of organized labourthe railway trades and construction workers. Unemployment and losses in wages combined with the disappearance of men into the armed forces following August 1914, weakened the organized labour movement in the city. However, in early 1917, spiraling wartime inflation and the prospect of conscription combined to revive organized labour and to bring about the reconstitution of the Bran-don Trades and Labour Council. The reconstituted Council stood for a “... square deal for all classes and no railroading.”  The Council immediately became involved in the debate concerning the question of fuel. For those organized workers who were able to secure increases in wages, the worst effects of the rise in the cost of living were ameliorated. However in 1917 only letter carriers, mail clerks, telegraph operators, and CNR trainmen and maintenance of way employees in Brandon received wage increases. In 1918, CPR shop workers, engineers and firemen, maintenance of way employees, and trainmen, as well as Dominion Express employees and Provincial Telephone workers, received wage increases. Not surprisingly, Brandon’s labour militants of 1919 were drawn primarily from those groups of workers including civic employees, carpenters, teamsters, bakers, brewery workers, and railway employees who had not achieved wage increases during the war. Some had suffered wage reductions, which were exacerbated by the sharp rise in the cost of living. The ability of the reconstituted Trades and Labour Council to gain affiliates, to reactivate union locals, and to organize new groups of workers was facilitated by the impact of the rising cost of living on the lives of individual workers and their families, and the determination of Brandon’s working people to address their worsening economic condition. Brandon’s organized labour movement had an immediate opportunity to test the utility of militant industrial unionism and labour solidarity in the struggle for union recognition, the right of collective bargaining, and better wages. In February, 1919, the recently established Civic Employees’ Union was refused recognition by City Council. This refusal and Council’s subsequent attack on the Union’s leadership precipitated a strike of civic employees which quickly threatened to become a general strike. In joining the Winnipeg General Strike, Brandon workers, in particular the city’s civic employees, were gambling their recent gains on the success of the general strike. Failure would almost certainly mean the loss of income and job security. Thus the decision of the Brandon workers to join the Winnipeg battle reflected both the confidence engendered by the success of the civic employees’ strike, and the militancy of those workers who were still to achieve union recognition, the right to collective bargaining, or wage increases. The decision also reflected the commitment of individuals such as Fred Baker and George Ayers, who had assumed leading positions in Brandon’s labour movement following the reconstitution of the Trades and Labour Council in the spring of 1917, to the principles of labour solidarity that had been enunciated at the Calgary Conference of Western Labour and embraced by the Brandon Trades and Labour Council. While the immediate objective of the strike was to win the right of collective bargaining for workers in Winnipeg metal trades, the Brandon strikers understood that success would advance the cause of labour in Brandon at a time when many Brandon workers were intent on achieving wage increases following four years of spiraling war-time inflation. The Brandon Sympathetic Strike was also fueled by contractual disputes created by the participation of workers in the Sympathetic Strike. 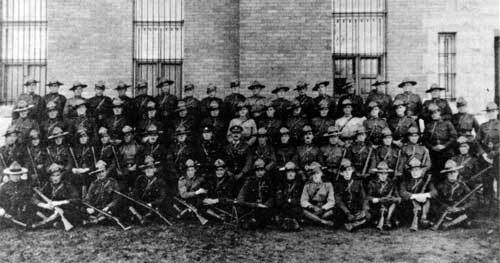 The Royal North West Mounted Police detachment, C troop at Brandon, 1919-20. Smith soon found himself in conflict with his congregation. His resignation was demanded and received. The Peoples’ Church was organized at a meeting held at the Starland Theatre on 8 June 1919. But it was too late. Regardless of the action of the running trades, the Brandon strike was soon to collapse. By Wednesday, 25 June, the Winnipeg General Strike was over. In Brandon, a meeting of the Strike Committee was convened at the Fraternal Hall. Following H. C. L. Broadhurst’s report that the City refused to reinstate striking civic employees “without prejudice,” or withdraw the requirement that civic employees renounce sympathetic strikes, the Strike Committee announced that a general strike of unions affiliated with the Trades and Labour Council would begin Thursday, 26 June. The decision to call the strike was taken only after it was agreed that no local would be bound by the decision to strike. Surprisingly, the Strike Committee believed that the direction for strike activity in western Canada could be shifted from Winnipeg to Brandon. Acting on this assumption, the Brandon Strike Committee wired Regina, Moose Jaw, Saskatoon, and Calgary asking that a general strike be called in each of these centers. The Brandon Committee’s call for a General Strike was a failure. The only workers to respond were the firemen and coal handlers at the Brandon pumping station. In the spring of 1919, the Brandon labour movement experimented with new forms of labour organization and new strategies of industrial action. The success of the civic employees’ strike, and the growing commitment of the western Canadian labour movement to direct action through the general strike, carried the Brandon labour movement forward with unprecedented militancy. The Sympathetic Strike in Brandon was the climactic event in a period of increasing labour aggressiveness dating from the reconstitution of the Trades and Labour Council in the spring of 1917. Launched in sympathy with Winnipeg in the defence of the principles of organized labour, the central purpose of the Strike was the defense of labour’s right to union recognition and collective bargaining. The complete absence of revolutionary intent on the part of labour was evident in the repeated efforts of the Strike Commit-tee to ensure social order and the maintenance of essential services. Nevertheless, to the Brandon Sun, the Law and Order league, and the majority of City Council, the strike was part of an evil conspiracy to overthrow constitutional authority. Negotiation with the disloyal was impossible: active civic opposition and the coercive power of the state were required to obliterate the strike. In the end, the state prevailed decisively. The collapse of the June strikes left organized labour in a state of turmoil and division. During the fall and winter of 1919-1920, the proponents of the One Big Union struggled with the advocates of the Trades and Labour Congress and the international craft unions for control of Brandon’s organized labour movement. In November 1919, a motion calling for the affiliation of the Brandon Trades and Labour Council with the One Big Union was referred to the Council’s affiliated locals. Though some organized workers in Brandon chose to affiliate with the O.B.U., by 1921 control over the Trades and Labour Council had been asserted by individuals loyal to the Trades and Labour Congress. While a small local of the One Big Union existed until 1923, the events of 1919 rendered the city’s organized labour movement wary in its approach to industrial conflict. The defense of working people in Brandon shifted to the political arena. In the aftermath of the strikes, Brandon’s labour community sought to foster working class solidarity and political action through the People’s Church, the Brandon Defence League, the Dominion Labour Party, the Trades and Labour Council, and in the spring of 1920, the Brandon Labour Party. The labour crisis of 1919 was an important event both in shaping the evolution of Brandon’s organized labour movement and in galvanizing the commitment of the city’s working people to direct participation in Brandon’s political life. The author would like to acknowledge useful suggestions made on an earlier draft of this paper by Errol Black and Joe Dolecki of the Economics Department, Brandon University. 1. Gregory S. Kealey, “1919: The Canadian Labour Protest,” Labour/Le Travail, (Spring, 1984), p. 29. 2. Census of Canada, 1911, Vol. 3. 3. See Alan Artibise, Prairie Urban Development, 1870-1930 (Ottawa: Canadian Historical Association Booklets, 1981), p. 18, for a discussion of the development and role of urban centers in western Canada prior to the Great War. 4. Census of Canada, 1911, Vol. 3. 6. Brandon Weekly Sun, 5 June 1902, p. 3. See also John Everitt, Marion Westenberger and Christoph Stadel, “The Historical Development of Brandon’s Social Areas, 1881-1914,” Alberta Geographer, No. 21 (1985), pp. 79-85. 7. Labour Gazette, Vol. II (1901-1902), p. 412. 8. The Voice, 27 July 1906; Harold A. Logan, The History of Trade-Union Organization in Canada (Chicago: The University of Chicago Press, 1918), p. 174. 9. These included the International Brotherhood Maintenance of Ways Employees, No. 197; Bricklayers, Masons, and Plasterers’ International Union, No. 2; Amalgamated Society of Carpenters and Joiners; Cigarmakers’ International Union, No. 378; International Brotherhood of Electrical Workers No. 441; International Hod Carriers, Building and Common Labourers’ Union, No. 69; Federated Association of Letter Carriers, No. 21; Brotherhood of Locomotive Firemen and Enginemen, No. 484; Brotherhood of Locomotive Firemen and Enginemen, No. 788; Amalgamated Sheet Metal Workers’ International Alliance, No. 421; International Association of Machinists, No. 574; American Federation of Musicians, No. 501; United Association of Journeymen Plumbers, Gas Fitters, Steam Fitters’ Helpers of United States and Canada, No. 258; Plasterers’ International Association of United States and Canada, No. 127; Brotherhood of Painters, Decorators and Paperhangers of America, No. 660; Brotherhood of Railway Carmen of American, No. 528; Canadian Brotherhood of Railway Employees, No. 37; Order of Rail-way Conductors, No. 464; Order of Railway Conductors, No. 605; Brotherhood of Railroad Trainmen, No. 394; Brotherhood of Rail-way Carmen, No. 339; International Typographical Union, No. 700. Labour Organizations in Canada, 1912, p. 85. 10. Labour Gazette, Vol. XIl (1911-1912), p. 993. 11. Brandon Weekly Sun, 18 April 1912, 22 August 1912, 29 August 1912. 12. Ibid., 22 August 1912. 13. Ibid., 29 August 1912. 14. Brandon Daily Sun, 11 February 1915; Brandon Weekly Sun, 18 February 1915. 15. Brandon Daily Sun, 12 April 1917. See also The Voice, 4 May 1917, for discussion of the demise and reconstitution of the Brandon Trades and Labour Council. 16. Brandon Daily Sun, 12 February 1917, 20 February 1917, 21 February 1917, 17 March 1917. 17. Ibid., 3 April 1917. 18. Ibid., 3 May 1917. 19. The Voice, 15 June 1917. 20. The Labour Gazette, Vol. XVII, 1917, pp. 992-993; The Labour Gazette, Vol. XVIII, 1918, p. 1012. 21. The Labour Gazette, Vol. XVII, 1917, p. 714. 22. Ibid., Vol. XVII, 1917, p. xiii-xiv; Ibid., Vol. XVIII, 1918, p. xiii-xv. 23. Labour Organizations in Canada, 1918, p. 161. 24. The Confederate, 16 May 1919. 25. A. Ross McCormack, Reformers, Rebels and Revolutionaries: The Western Canadian Radical Movement, 1899-1919 (Toronto: University of Toronto Press, 1977), p. 69. 26. The Confederate, 14 March 1919; Ibid., 4 April 1919. 27. PAM, One Big Union Papers, C. A. Page to R. B. Russell, 5 April 1919. At the Calgary Conference, Fred Baker was named to the Manitoba Committee charged with promoting the One Big Union. See Norman Penner, Winnipeg 1919: The Strikers’ Own History of the General Strike (Toronto: James Lorimer and Company, 1975) p. 30. Baker had come to Brandon in 1913 to work in the car repair shops of the Canadian Northern Railway. In 1917 and 1918, Baker served as President of the reconstituted Trades and Labour Council. In 1919, Baker was perhaps the most militant of Brandon’s labour leadership. Henderson’s Directory (1913-1919), Brandon. 28. Brandon Daily Sun, 18 February 1919. 29. Brandon Weekly Sun, 27 January 1915; Brandon Daily Sun, 22 July 1916, 31 July 1916, 5 August 1916, 8 August 1916, 9 August 1916, 11 August 1916, 5 March 1917, 11 April 1917, 14 April 1917, 17 April 1917, 8 May 1917, 17 May 1917, 1 June 1917, 9 February 1918, 13 February 1918. 30. Bryan D. Palmer, Working-Class Experience: The Rise and Reconstitution of Canadian Labour, 1800-1980 (Toronto: Butterworth and Co., 1983), p. 143. 31. Brandon Daily Sun, 18 March 1919. 32. H. C. L. Broadhurst came to Canada from the Channel Islands, Britain, and took up farming in the Miniota district. In 1913, he came to Brandon, working first as a reporter on the Brandon Sun, and subsequently as an accountant in a Brandon business. He joined the City’s tax collection department in 1917. Broadhurst was initially associated with the Conservative Party. His experience as President of the Civic Employees’ Union changed his perspective. In the municipal election of 1920, he ran unsuccessfully for the School Board as a Dominion Labour Party candidate endorsed by the Trades and Labour Council. In a letter to the electorate, Broadhurst described himself as “... a worker with a worker’s outlook ...” The Confederate, 19 November 1920. See obituary of Lillian Broadhurst, Brandon Sun, 13 January 1966; Henderson’s Directory (1913-1919), Brandon. 33. Brandon Daily Sun, 23 April 1919, 30 April 1919. 34. Ibid., 24 April 1919. 35. Ibid., 26 April 1919. 36. Ibid., 26 April 1919; Manitoba Free Press, 28 April 1919. 37. Brandon Daily Sun, 26 April 1919. The committee included Rev. J. G. Miller, a Presbyterian minister; W. C. Hughes, real estate manager; P. A. Kennedy, a druggist; H. W. Rankin, a grocer. Henderson’s Directory, 1919, Brandon. 38. D. C. Masters, The Winnipeg General Strike, (Toronto: University of Toronto Press, 1950), p. 14. 39. Brandon Daily Sun, 28 April 1919; Manitoba Free Press, 29 April 1919. 40. Brandon Daily Sun, 29 April 1919. 42. Ibid., 14 May 1919. 44. Western Labour News, 21 May 1919. George Artimus Ayers was a Scottish immigrant who came to Brandon in 1911 to work as a section foreman on the Canadian Northern. Like Fred Baker, Ayers became active in the Trades and Labour Council in 1917. He served as President of the Council during the tumultuous events of 1919. In the spring of 1920, Ayers was selected to lead A. E. Smith’s successful election campaign committee, and was elected President of the Brandon local of the Dominion Labour Party in July 1920. Henderson’s Directory (1911-1920), Brandon; obituary of George Artimus Ayers, Brandon Sun, 11 September 1965; obituary of Mrs. G. A. Ayers, Brandon Sun, 2 January 1958. The Confederate, July 1920. 45. Western Labour News, 20 May 1919. 46. Brandon Daily Sun, 20 May 1919, 21 May 1919, 23 May 1919, 26 May 1919. The Montreal Gazette, 30 May 1919. 47. PAM, Salton Collection, MG7, F8, Box 1, Brandon Trades and Labour Council, Strike Bulletin No. 1, 21 May 1919. 48. H. C. Pentland, “Fifty Years After,” Canadian Dimension, July 1969, p. 14. 50. Brandon Daily Sun, 26 May 1919. 51. Salton Collection, Box 1, Brandon Trades and Labour Council, Strike Bulletin No. 3, 23 May 1919. 53. PAC, Sympathetic Strike Brandon, June 1919, RG27, Vol. 313, file 150. Inspector F. H. French, (R.N.W.M.P.) to Commissioner, 25 May 1919. 55. Brandon Daily Sun, 27 May 1919. 56. PAC, Sympathetic Strike Brandon, June 1919. RG27, Vol. 313, file 150, Inspt. F. H. French, R.N.W.M.P. (Brandon) to Commissioner, 25 May 1919. 57. PAC, Police Assistant to Brandon, Manitoba during civil strike, 1919. RG18, Vol. 578, File 347, 1919. A.R. McDiarmid to Inspector F. H. French R.N.W.M.P. (Brandon), 9 September 1919. 59. Brandon Daily Sun, 6 June 1919. 60. Ibid., 28 May 1919. 61. Ibid., 27 May 1919. 62. Ibid., 3 June 1919. 63. Ibid., 5 June 1919. 64. Brandon Daily Sun, 26 May 1919, 3 June 1919. 65. Salton Collection, Box 1, Brandon Trades and Labour Council, Strike Bulletin No. 1, 21 May 1919. 66. Salton Collection, Box 1, Strike Bulletin No. 3, 23 May 1919; Strike Bulletin No. 5, 31 May 1919. 67. Sympathetic Brandon, June 1919, Constable J. T. McGregor R.N.W.M.P. (Brandon), to Inspt. F. H. French, R.N.W.M.P. (Brandon), 7 June 1919. 68. Brandon Daily Sun, 13 February 1915, 15 May 1915, 7 June 1915. 69. Sympathetic Brandon, June 1919, Inspt. F. H. French, R.N.W.M.P. (Brandon) to the Commissioner, 28 June 1919; Corpl. D. Edward and Corpl. C. Saul R.N.W.M.P. (Brandon) to Inspt. F. H. French R.N.W.M.P. (Brandon), 7 June 1919. Brandon Daily Sun, 7 June 1919. H. W. Bartholomew, a native of the United Kingdom, quickly emerged as a leading figure in the strike leadership. Bartholomew, while not holding any official position in the Brandon labour movement, was clearly influential in labour councils and as a platform speaker. He was also a determined advocate of the One Big Union. In the spring of 1920, Bartholomew unsuccessfully sought the nomination to run in the provincial election as a Brandon Labour Party candidate. He moved to Winnipeg and became active in the Socialist Party of Canada. In 1922, he joined the Workers’ Party of Canada and remained an active Communist until his death in 1931. Bartholomew’s initial participation in the strike was reported in the Brandon Daily Sun, June 6, 1919. See Ivan Avakamovic, The Communist Party: A History (Toronto: McClelland and Stewart, 1974), p. 24; Ian Angus, Canadian Bolsheviks: The Early Years of the Columnist Party of Canada (Montreal: Vanguard Publications, 1981), p. 97. 70. L. Clark, Brandon’s Politics and Politicians (Brandon: Brandon Sun, 1981) p. 95. The Rev. A. E. Smith had a lengthy career as a clergyman in the Methodist Church. In 1912, he became Minister of First Methodist Church in Brandon, one of the wealthiest churches in the city. As an active supporter of church union, Smith was chosen President of the Manitoba Conference in 1916 and 1917. Smith was the first clerical delegate to the Brandon Trades and Labour Council. He recalled his career in his autobiography All My Life (Toronto: Progress Books, 1949). In his article on Smith, “From Clergyman to Communist: The Radicalization of Albert Edward Smith,” Journal of Canadian Studies, Vol. 13, No. 4 (Winter, 1978-79), J. Petryshyn ignores the central importance to Smith’s radicalization of his involvement in the Brandon labour movement, and the Brandon labour strife of 1919. 71. Smith, All My Life, p. 48. 72. PAM, Brigden Collection, MG14, C14, Beatrice Brigden to Dr. T. A. Moore, 26 July 1919. 75. Minutes of Sanatorium Attendants’ Federal Union No. 27, 27 March 1919; 7 April 1919; 20 April 1919, in author’s possession. 76. Winnipeg Tribune, 13 August 1969. 77. Brandon Daily Sun, 18 June 1919. 78. Ibid., 20 June 1919. See also Penner, Winnipeg, 1919, p. 158, for the subsequent arrest of Pritchard in Calgary. 79. Brandon Daily Sun, 26 June 1919. See also Sympathetic Brandon, June 1919, Inspt. F. H. French R.N.W.M.P. (Brandon) to the Commissioner, 28 June 1919. 80. Sympathetic Brandon, June 1919, Inspt. F. H. French R.N.W.M.P. (Brandon) to the Commissioner, 27 June 1919. 81. Sympathetic Brandon, Inspt. F. H. French (R.N.W.M.P. ), to the Commissioner, 27 June 1919. 82. Brandon Daily Sun, 2 July 1919. 84. Brandon Daily Sun, 26 June 1919. See also Sympathetic Brandon, June 1919, Inspt. F. H. French R.N.W.M.P. (Brandon) to the Commissioner, 2 July 1919. 85. Sympathetic Brandon, June 1919, Inspt. F. H. French R.N.W.M.P. (Brandon) to the Commissioner, 3 July 1919.